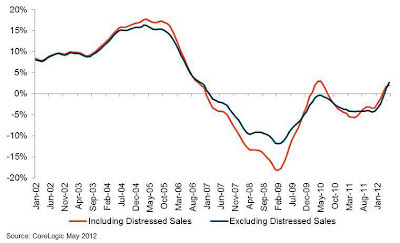 "Home prices nationwide, including distressed sales, increased on a year-over-year basis by 2.0 percent in May 2012 compared to May 2011 (see red line in chart above). On a month-over-month basis, home prices, including distressed sales, also increased by 1.8 percent in May 2012 compared to April 2012. The May 2012 figures mark the third consecutive increase in home prices nationwide on both a year-over-year and month-over-month basis. Excluding distressed sales, home prices nationwide increased on a year-over-year basis by 2.7 percent in May 2012 compared to May 2011, see blue line in chart. [MP: This is the largest annual increase since late 2006.] On a month-over-month basis excluding distressed sales, home prices increased 2.3 percent in May 2012 compared to April 2012, the fourth month-over-month increase in a row. The CoreLogic Pending HPI indicates that house prices, including distressed sales, will rise by at least another 1.4 percent from May 2012 to June 2012. Excluding distressed sales, house prices are also poised to rise by 2.0 percent during that same time period. The CoreLogic Pending HPI is a new and exclusive metric that was introduced within the April 2012 HPI report. It provides the most current indication of trends in home prices, and is based on Multiple Listing Service (MLS) data that measure price changes in the most recent month. MP: The home price increases reported today by CoreLogic for May and the last several months are consistent with the gains in the FHFA House Price Index (HPI), featured last Thursday on CD. The FHFA's HPI increased by 3% in May from a year earlier, which was the third straight monthly increase, and the largest year-over-year gain since November 2006. Slowly but surely, the U.S. housing market is making a comeback, with more evidence today of rising home prices in May according to CoreLogic's HPI. "Excluding distressed sales, house prices are also poised to rise by 2.0 percent during that same time period." 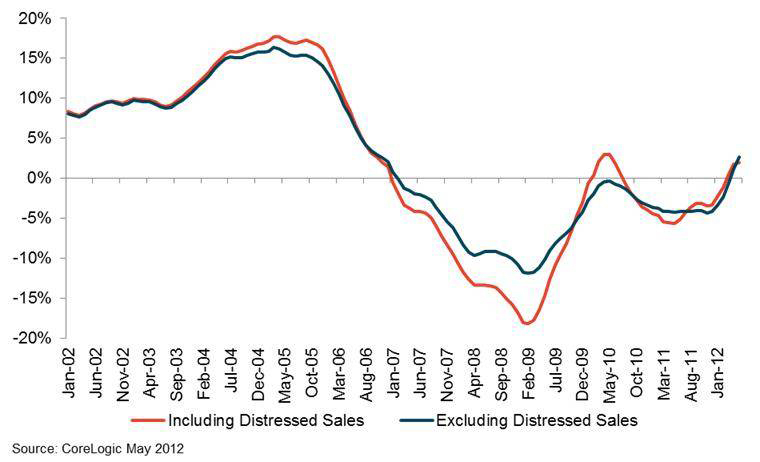 If we exclude distressed sales then 25% of sales are not included. The bottom in the housing market is in the rear view mirror, but still quite a bit of troubled inventory in neighborhoods exists. If the market is getting better why is it that FHA is guaranteeing 3% down loans for $600K homes? House prices can go up in nominal terms very easily. All the Fed has to do is pursue another QE program as it tries to help get Obama reelected.